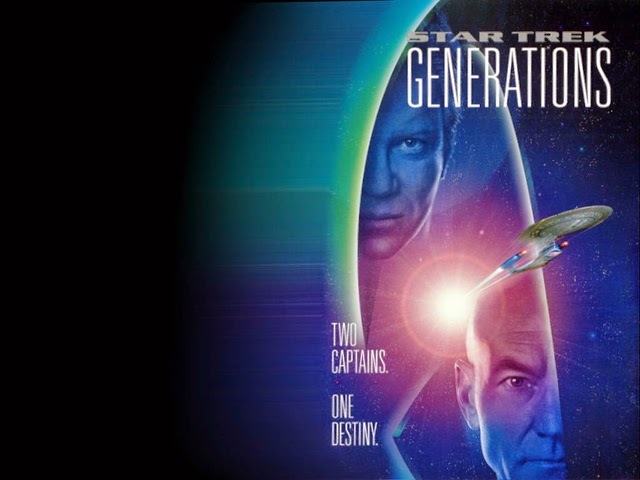 Looking Back At STAR TREK: GENERATIONS | Warped Factor - Words in the Key of Geek. In this weeks Star Trek column Tom Pheby revisits 1994s Star Trek: Generations. As any Star Trek fan will freely admit (hopefully) Trek films can be a bit of a lottery, drifting between brilliant and mediocre - sometimes in the same film! This is not the best way to treat a loyal following and at times it appears like a cash gathering exercise, something that could certainly apply to Star Trek: Generations. If you stack this adventure against First Contact or Wrath of Khan you will see exactly what I mean, but the cash registers were still ringing excitably and that was sweet music to Hollywood's ears. The general plan must have been to fashion a smooth transition by mixing the 'Old' with the 'New', thus keeping us enthralled for ... well, generations. The film makers established their own type of insurance policy by having both crews on duty, possibly thinking that if you didn't like one then the other would appeal. Sounds brutal but unfortunately it appears to be true in this case. What should have, and could have, been an epic film is no more than a lazy half baked extravagance that leaves you wondering "if only". The film is formulaic to a huge degree, Trek by numbers if you like, so much so that Leonard Nimoy couldn't even be bothered to don those famous pointed ears, and who could blame him? You could imagine him reading the script and raising that eyebrow in a quizzical Spock like fashion before muttering "This is illogical" - and he would have been bang on. To help tempt him back Nimoy was offered the role of director but after reading this hotch potch he probably feigned a mystery illness. McCoy is also AWOL, no doubt washing his hair! 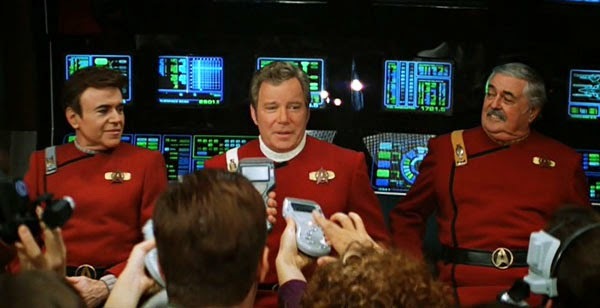 So we end up with the token trio of Kirk, Scotty and Chekov who seem to be there for appearances sake only. They appear as the honored guests on the refitted Enterprise B as part of a giant PR exercise by Star Fleet command and I for one found this a little sad. I'll grant you Kirk and Co could hardly be expected to totter around the galaxy on arthritic joints with bulging midriffs and sporting suspect hairpieces for all eternity but their roles were distinctly fluffy and worthless. So, now I've absolutely demolished it, I'd best tell you what it's about: It's the maiden voyage of the new Enterprise, which seems to suffer weekly refits .On board are a gaggle of annoying reporter types waiting for something to happen, which is just as well because I thought it was just me! Wouldn't you know it, there's a SITUATION or to be more precise a coil of space energy (again) known as the Nexus. This apparently provides unadulterated joy to those consumed by it, if Star Fleets own Mystic Meg and El-Aurian, Whoopi Goldberg is to be believed. The Nexus plays with the idea of joyous moments being relived over and over again in place of the harsher restrictions of reality, so it's either a drawn out dream or the prospect of the normality - all very Trek. We are introduced to the villain of the piece Dr Soran, an El -Aurian played by Malcolm McDowell. Soran is like a space boomerang who has to be rescued for what feels like the entire film before he becomes even more villainous stopping just short of a pantomime laugh. I expect that after seeing Star Trek: Generations McDowell either sacked his agent or started reading the scripts in advance to avoid appearing in anything similar, but he gives his all and comes out the other side relatively unscathed. On discovering what the Nexus can do, Soran wants some of the action, so by way of using solar probes and by destroying half the solar system, he can bring it closer and into his evil clutches (cue villainous laugh). Once that's achieved it's just a case of leaping inside it to achieve the joy he craves. Star Trek: Generations is like wading out to sea with your trouser pockets full of lead, too much detail deprives it of action and it's so weighted down with Scientific bumph which makes it buckle in the middle. It's plot heavy with additional subplot after subplot, and in the end just makes you feel worn out and weary. On the other hand it still looks fabulous on the big screen, not that that makes up for the deadly dull pace. Data's emotion chip saga was the only bit of fun to be had, but it's a joke that wears thin very quickly. Even Kirks demise is a dull affair, he should have really signed off with a bang that befitted his considerable contribution to the franchise but it was an understated whimper that only merited vague acknowledgement. It's a genuine shame that Star Trek: Generations didn't live up to expectations. It boldly strolls over well worn, predictable ground and fails to get anywhere near warp speed. So for those of you that think the older versions are better than the reboots, watch this installment and think again.